It sees your every move. It can stamp out your life in a millisecond. You can neither see nor hear it, but it's always above you. Watching. 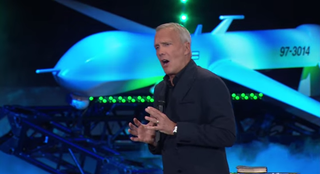 If you're struggling to understand God, allow a Dallas pastor to offer a more relatable metaphor: Drones. Cool pastor/skinny jeans enthusiast Ed Young, author of New York Times bestseller SEXPERIMENT: 7 Days to Lasting Intimacy with Your Spouse, recently delivered a rousing sermon about "the omnipresence of God," a topic that was apparently such a snoozefest that it needed spicing up with a topical reference ripped straight from the headlines. "When it comes to God being everywhere, we have nothing to compare that with," says Young in a sermon highlighted today by Qz. Except for unmanned combat aerial vehicles, obviously. They see things we never thought possible. And we're gonna go, 'wow, I kind of feel weird about that. I don't know about the privacy issues.' Well, God makes a drone seem like a drone doesn't know a thing. There's no such thing in God's economy as a clandestine meeting. There's no such thing as a closed office door, bedroom door, front door, or back door. Pastor Young isn't above a little levity, so he points out there's another, less fatal drone in attendance: A UAV hovering above the heads of attendees. "Above me you'll see a drone," he adds. "It's taking footage of you and me. It'll especially be active during the offering time." In another totally hilarious and not at all offensive moment, he swings across the stage to show off his confident "pimp limp."